Wimbledon final: Federer is the favorite, but can Cilic shock Roger? 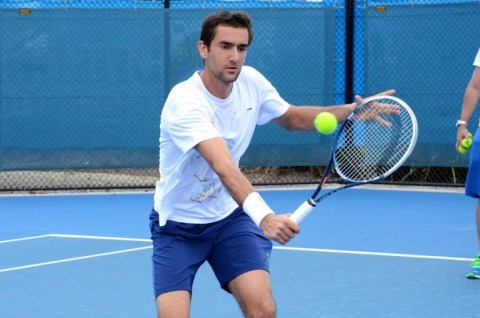 How good is Marian Cilic right now? Very good? Incredibly good? Fantastically good? It’s very hard to tell, because in the 13 days at Wimbledon, he has been more mature, his forehand is finally consistent again, his serve is gigantic, and he is very forceful at the net. But he can actually stun Roger Federer? He did upset the Swiss almost three years ago in the semis at the US Open. But that was it, because Federer has beat him six times, on hard courts and clay, and obviously, the 18-time Grand Slam champion can changed it inside the court and mix it up until the Croatian gets frustrated. On occasion, that can happen with Federer, but it is very rare, and even when he is not feeling the ball, he has so many different shots, which is why he has won 85 titles, and Cilic has grabbed 17 titles. That is a huge difference. The 28-year-old Croatian says he is playing almost perfectly, and that if he plays as good as he can, he will have an opportunity to win it. Maybe, but if Federer plays great, then he will beat Cilic, hands down. The 35-year-old Federer might be a little older, but he has always been so quick, he can bend down so low and see everything coming at him. His forehand is better than anyone on the tour, his backhand has so much variety, and his serve is amazing. It is big, it twists and it moves to the left, to the right and down the middle to knock at his opponent’s his chest. At the net, there are times that Federer misses it, but still, he is right on top of the net and can put it away. Look, Federer is a huge favorite. This season, he has been almost perfect. His body is just fine, he is strong and he is extremely happy. Cilic will try as hard as he can, but that doesn’t mean that he can out-hit him and wear him down. Federer can, and he will, take his record eighth Wimbledon title in four sets. That will be 19 Grand Slams for “Rog.” Phenomenal.